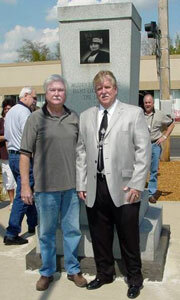 Hardy Williams (L) and Benny Adair with 7-ton Mother Jones Workers’ Memorial. When Machinists say they’re going to do something, they do it, even if an eight-hour trip turns into a two-day ordeal that included three flat tires. Benny Adair, District 154 DBR and Vice President of the AFL-CIO Western Kentucky Area Council, along with retired Local 1294 member Hardy Williams, volunteered their time, a truck and trailer to transport a seven-ton Workers’ Memorial from the old Kentucky State AFL-CIO headquarters in Frankfurt to the Western Kentucky Council 250 miles away in Paducah. The granite memorial is etched with a portrait of labor pioneer Mary Harris “Mother” Jones and honors workers killed on the job. “We wanted to save the council some money,” said Adair who asked for the monument on behalf of the Western Kentucky Council when the state AFL-CIO headquarters was sold last year. To read the full story, go to AFL-CIO NowBlog.